Historically, artisan stone-craft required a lot of work. We can do that. 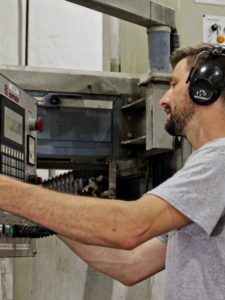 Laser guided, diamond finishing equipment and CNC machines have made working with stone faster. But, mistakes just happen quicker if you don’t know your craft. Like all worthy artisans, we know how to use our tools. Some of the recent stone-work advances revolve around computing equipment used on location for pre-installation measurements. The 3D models generated by this technology are sent directly to the CNC machine. Measuring and cutting tolerances are as tight as they’ve ever been and that’s good news for homeowners. 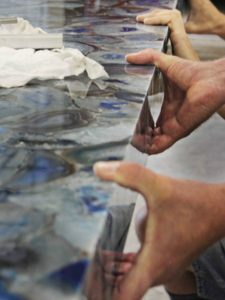 With all of the advancements in stone tech over the past several decades, you might think that we could just push a button and deliver perfect counter tops. But, natural materials are uniquely and wonderfully inconsistent. Every slab has its own grain and the artisan needs to know where and how to cut the stone to make seams visually appealing (CNC machines can’t see very well). Natural stone is made up of mineral deposits causing some of the surface areas to polish inconsistently. This requires hand buffing until the counter top is perfect. Sometimes those same minerals chip during the cutting or routing process. Craftsmanship requires skill, patience and a good eye. Our artisans know stone, know their equipment, and understand the techniques necessary to create beautiful, functional art for your home.